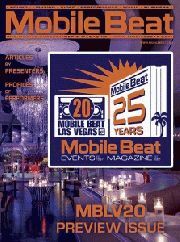 Dec 22, 2015 Mobile Beat welcomes Jon Taffer, the tough-talking “fixer” of SpikeTV’s Bar Rescue, as the Celebrity Keynote for MBLV20, the 20th Anniversary Mobile Beat Las Vegas event. Jul 13, 2015 I am a self-admitted Dj Show/Expo junkie. I attended my first dj show in 1989 put on locally in the Chicagoland area by a Dj supply store. The show was covered by Robert Lindquist in the very first issue of Mobile Beat. By Keith KoKoruz. Jun 21, 2015 Why now more than ever, attending the LVDJ Show important. At the LVDJ Show, you will be enjoying the company of like-minded business owners that strive to take their investment in their business to the next level. Feb 2, 2015 After last year’s superior educational content, conference organizers set their sights on an even higher level. Nov 30, 2014 Having covered the LDI Show for over 15 years, I would like to pull that culinary term out to describe what I witnessed just last week in Las Vegas. Jul 23, 2013 CHAUVET® DJ and TRUSST® present two seminars filled with tips to maximize profits at any mobile gig during the 2013 DJ Expo which takes place August 12 – 15 at the Trump Taj Mahal in Atlantic City. Jun 25, 2013 I love going to DJ conferences. There is nothing cooler than being able to network with other DJs, to share with them something of value and to have an impact on someone's business. Jul 3, 2012 Not only will those attending the Las Vegas DJ Show in September be able to see the latest in state-of-the-art DJ equipment from American DJ and American Audio, they will also have a chance to learn lighting tricks and techniques from one of the best in the business, Michael “DJ Mikey Mike” Susca.